CBC Radio One, Edmonton AM (AB), 2 July 2014. 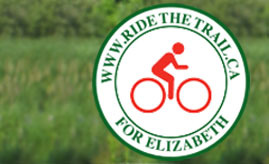 Edmund Aunger's wife was a key voice in the campaign to improve the Trans Canada Trail through Alberta before she was killed by a drunk driver while riding on a narrow shoulder. Now her husband is going to ride from Edmonton to Winnipeg to raise awareness about this underfunded project. With Mark Connolly.